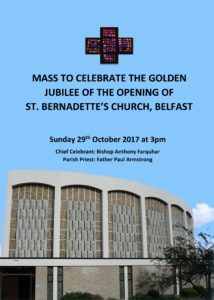 The Golden Jubilee of the iconic fan-shaped St. Bernadette’s Church is being celebrated this year, with its highlight being the Anniversary Mass taking place on 29th October – 50 years to the day since the building was dedicated by Bishop William Philbin. Very extensive renovations have been undertaken to the church (which is a B+ listed building) over the last two years in anticipation of the Jubilee, most notable of which is the restoration of the striking stained glass windows which trace the colours of the rainbow and follow the path of the sun through the day, centred on a vivid cross. The church is also very well known for Dame Elisabeth’s Frink’s nine foot high sculpture of Christ which floats above its altar, and for its many other items of fine modern art. Chief celebrant of the Anniversary Mass will be Bishop Anthony Farquhar, who took part in both the laying of the foundation stone and the Dedication Mass, and has since returned on many occasions. He will concelebrate with Parish Priest Fr. Paul Armstrong and many of the priests who have served St. Bernadette’s over the years. Everyone is welcome to attend, and in particular former parishioners.